Nigeria beat a much improved Seychelles 3-1 in their final AFCON 2019 qualifiers at the Stephen Keshi Stadium, Asaba on Friday. 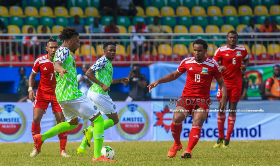 The Gavin Jeanne-led side proved a lot tougher nut to crack unlike in Mahè and the Super Eagles had to work their socks off particularly in the first period. Stoke City man Oghenekaro Etebo saw two brilliant shots thwarted, once curling just over the bar before seeing the opposing goalkeeper get a finger tip to another of his brilliant effort. For all their resistance, Seychelles were soon behind 34 minutes in after Karle Hall fouled Wilfred Ndidi from behind in the box, paving the way for Odion Ighalo to step up and send the goalkeeper the wrong way. But the spirited visitors rallied to pull themselves back on level terms just before the break, Rody Melanie profiting from a comical error to score after Nigeria failed to properly deal with a floated ball into the area. Nigeria retook the lead just after half time when Jamilu Collins sent in a brilliant ball for Henry Onyekuru to nip in behind the defenders and head home with the slightest of touches. And Simon Moses, making his first competitive appearance since his injury last year came off the bench to add the icing on the cake with a brilliant goal and set up the team in good mood ahead of the date with Egypt.